Car sales up 26.6% in March | What Car? Small-car sales, scrappage deals and the new '10' registration plate helped to boost registration figures by 26% in March. In total, 397,383 new cars were registered, according to figures from the Society of Motor Manufacturers and Traders (SMMT). 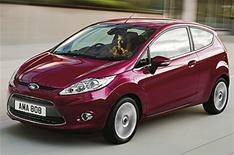 Superminis and small family cars continued to dominate sales, with the Ford Fiesta leading the pack with 23,681 sales, followed by the Ford Focus with 17,989 and the Vauxhall Astra on 15,326. The SMMT says scrappage accounted for 12.2% of sales in March, but it predicts the end of the scheme, and continued economic uncertainty, will lead to a decline in registrations through the remainder of 2010. March is usually the busiest month of the year for sales, followed by September, which also signals the release of a new registration plate. Since 1999, March has recorded average sales of 418,404, or 14.4% of annual registrations.